Bradley has been in practice for almost 30 years, having graduated from Guys Dental Hospital in 1986. He established his practice in Stevenage Old Town in 1990. 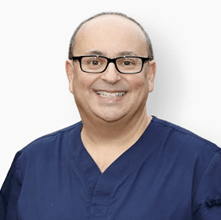 He is passionate about dentistry and regularly attends postgraduate courses to continue to offer his patients the very best dental care he can. He enjoys most aspects of dentistry but he is particularly interested in modern restorative and cosmetic techniques, root canal therapy and occlusion. Bradley is a long-term member of the British Academy of Cosmetic Dentistry (BACD). His outside interests include: Travel, Family, Friends, and an obsession with computers and technology. Bradley belongs to a gym and continues to subsidise everybody else’s membership fees.